It's the perfect way to open the University of the Philippines' new Arts Wing. 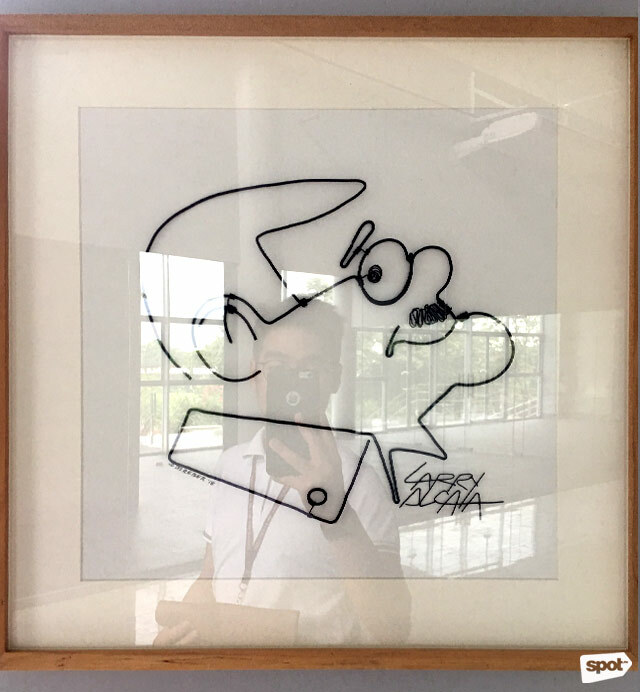 (SPOT.ph) The success of an artist is not measured by the number of works produced, but rather in the number of people he or she has inspired—as is the case of renowned illustrator Larry Alcala. 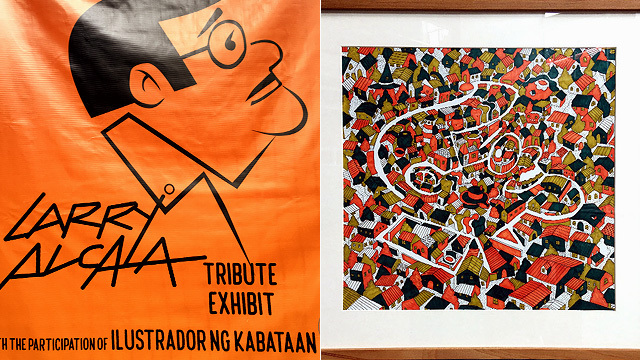 The annual exhibit Ala’ Alcala, organized by art group Ang Ilustrador ng Kabataan and the Samahang Kartunista ng Pilipinas—an organization he co-founded in 1978—pays tribute through creative interpretations of the artist’s life. Rev Cruz uses his signature coffee art to make his own rendition of Alcala's portrait. The use of coffee as his main medium adds not only texture to the artwork but a touch of freshness to an old master's piece. Cruz works as a physical therapist by day, but that hasn't stopped from harnessing his talent in illustrating. Children's book illustrator Liza Flores is well-known for her paper cut-outs, a technique she employed in "Paggunita." 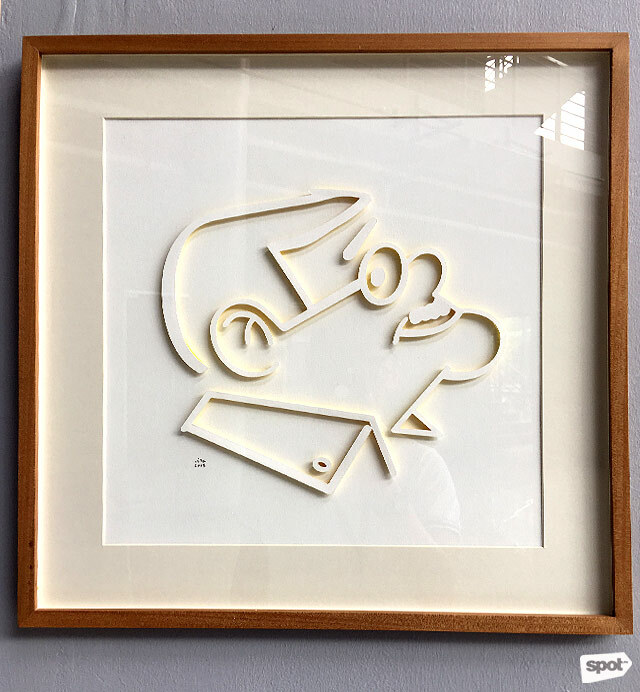 The title, which is roughly translated into English as "remembering," couldn't be more apt for a work that pays tribute to the legendary cartoonist. In the past, Flores made illustrations for The Secret is in the Soil, which won the National Chidren's Book Awards in 2012; But That Won't Wake Me Up, winner of the 2012 Filipino Reader's Choice Awards; and the LGBT-themed book Chenelyn, Chenelyn! 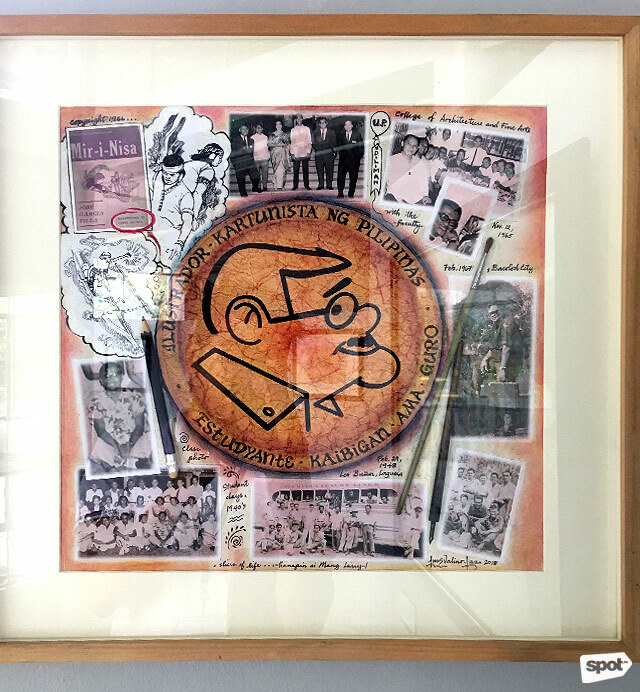 Lormie Valinon Lazo presents a nostalgic piece by putting together a collage of Alcala's past illustrations and photographs with his family and friends. She immortalizes the illustrator by putting his face in a coin, the same way Philippine coins bear the face of our heroes. Full-time illustrator and graphic designer Frances Alvarez interned in 2015 at the Cornell Lab of Ornithology in Ithaca, New York. With her passion for wildlife and the environment, it doesn't come as a surprise that her depiction of Alcala makes use of the image of a tree sprouting out of a book. 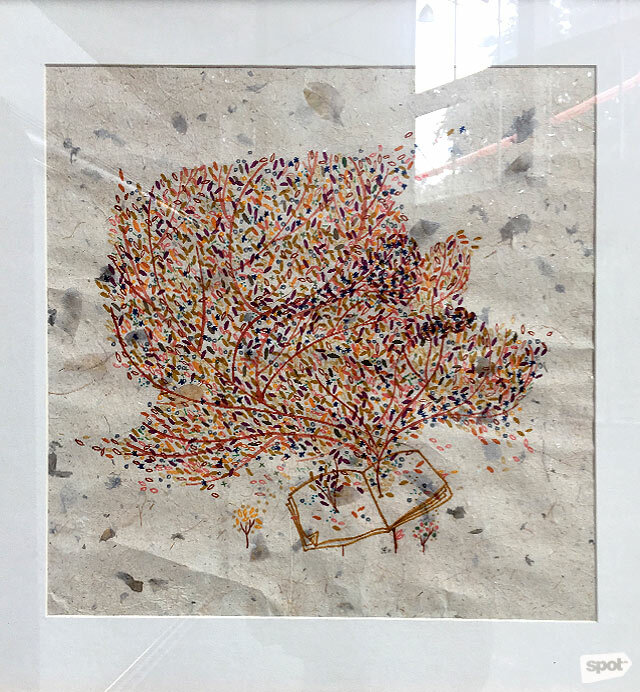 What’s notable about the artwork is that it uses handmade paper as base. Jo Ann Bereber-Gando, illustrator of children's books Ang Barumbadong Bus and Ang Bisikleta ni Momon, used black wires shaped as Alcala's face for her work. It embodies what the master illustrator had in mind when he founded various artist groups—to elevate cartooning through the exploration of various media. Dominic Agsaway, illustrator of Xi Zuq's Ngumiti Si Andoy and Will Ortiz' Piknik, mapped out Alcala’s portrait through rows of houses with different forms and sizes. 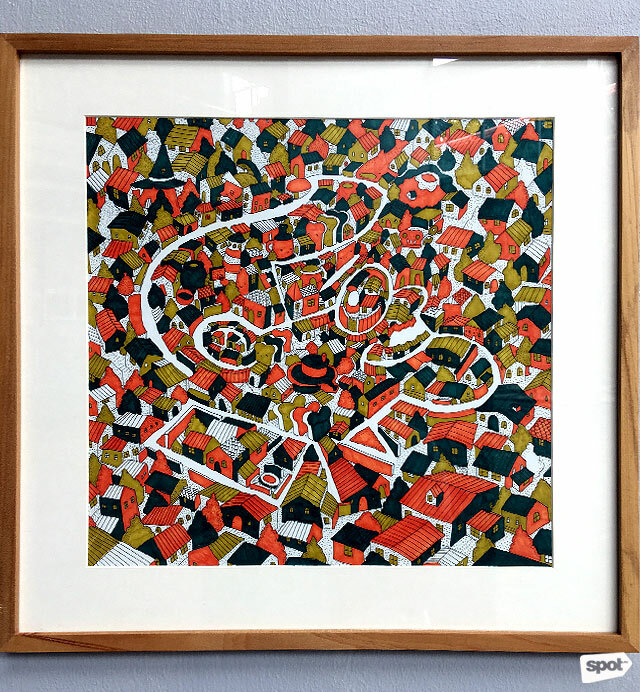 The curved roads and streets that make up the neighborhood of orange-and-green homes show the lines of the artist's caricature. It was in 2016 when Mitzi Aguilar-Reyes had her first solo show, Leaving Impressions, which explored themes of nostalgia and death through paintings of dried leaves, a canopy of towering trees, and small patches of green. 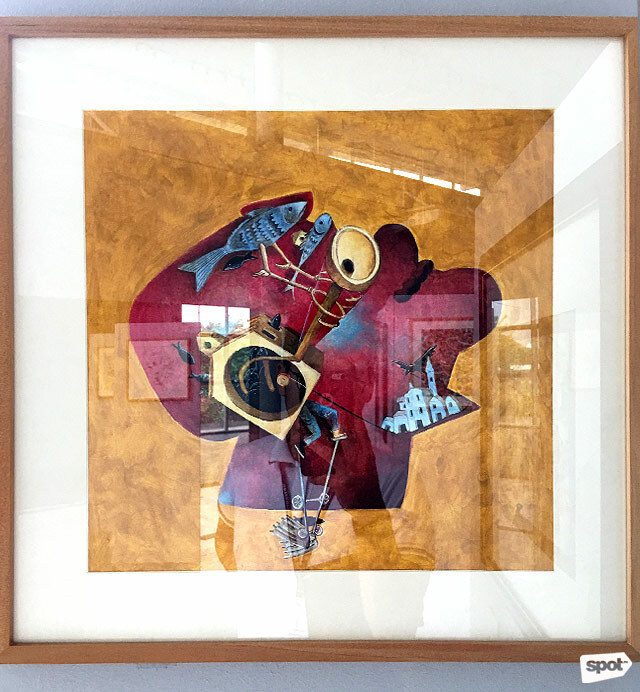 For Ala' Alcala, she looks to a different medium and turns to a technique called collagraphy. 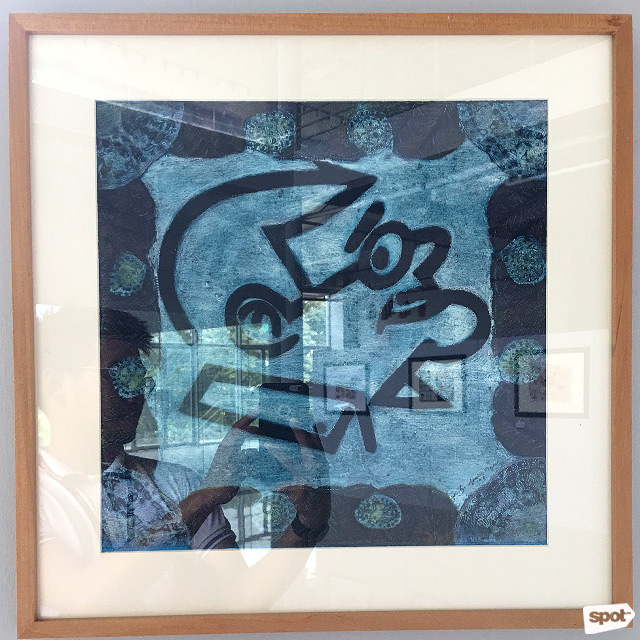 This printmaking process involves gluing a collage to a printing plate, waiting for it to dry, painting on the varnished side, and pressing paper on the surface. Multimedia artist Mariano Ching is known for large-scale paintings that often portray a post-apocalyptic setting and sculptures that are whimsical and out-of-this-world. 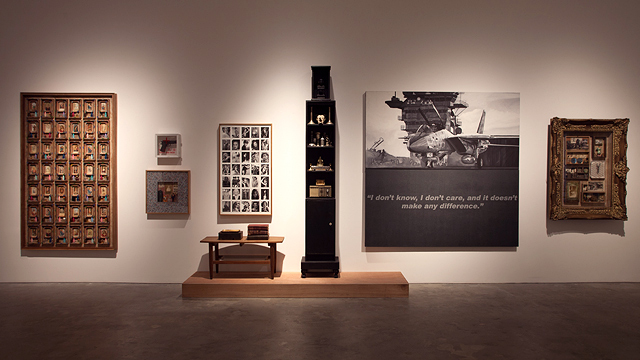 For the tribute exhibit, he expands his fascination for various media by using wood burning as part of his design process. 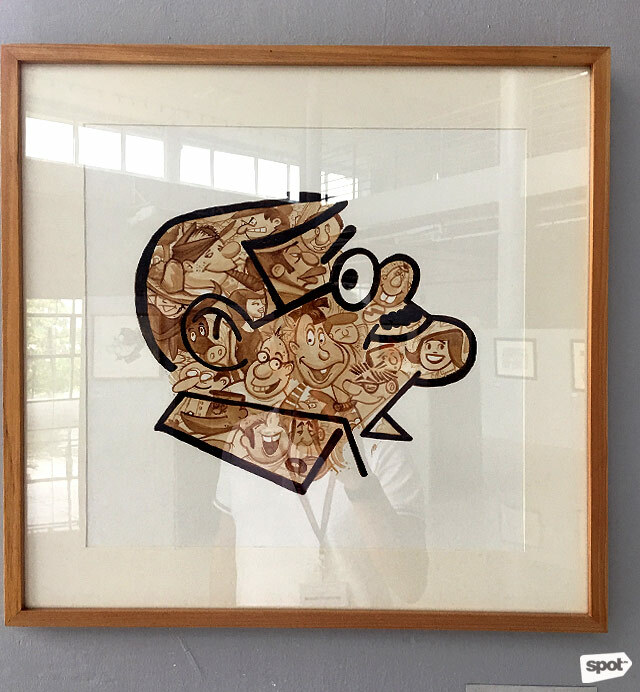 "Bing Bam Bung" features Alcala's famous characters Bing, Bam, and Bung put together and shaped as the cartoonist's portrait. Alcala's cartoon series Slice of Life was published every weekend starting in 1980 all the way to 2002. It captured the many aspects of everyday life in the Philippines—the bustling street stalls, preparations for a local fiesta, and the craziness inside a grocery. 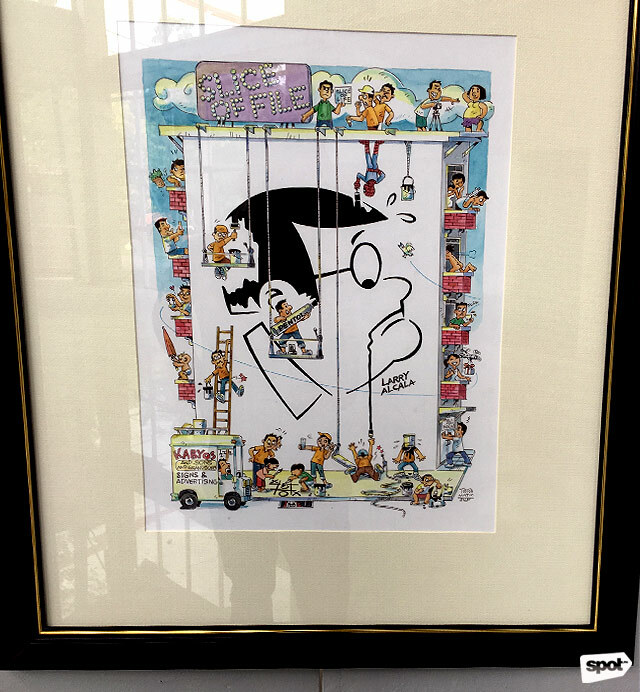 Yonzon pays tribute to the artist behind the legendary cartoon through a funny painting of people doing Alcala's mural on a five-storey building. Jericho Moral, a full-time illustrator, makes use of his signature color palette of reds and oranges for his tribute. He also includes his usual subjects of a fish with bird legs, a church with a huge hole, and other idiosyncratic imagery to portray Alcala's caricature. 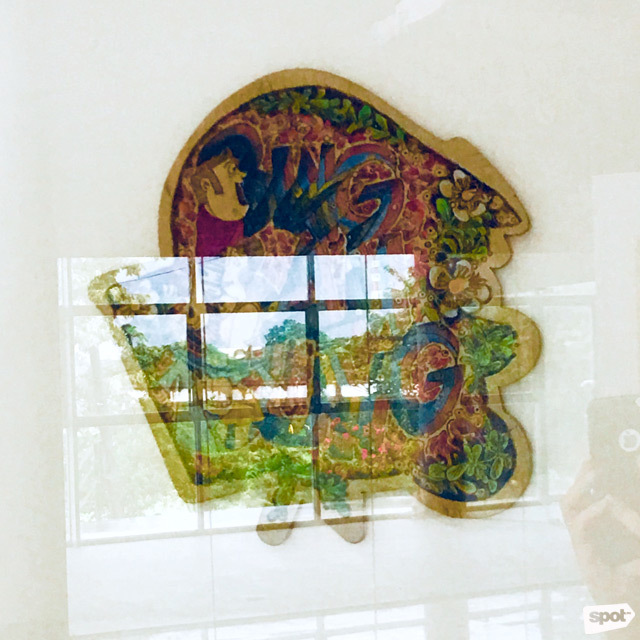 Ala’ Alcala runs until October 13 at the new Art and Design West Wing of the College of Fine Arts, University of the Philippines - Diliman, Quezon City. 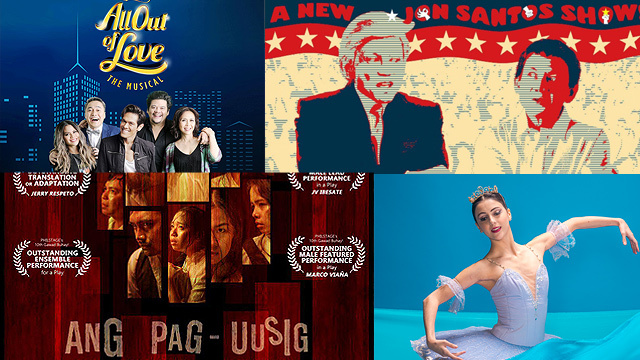 For more information, follow Samahang Kartunista ng Pilipinas on Facebook.